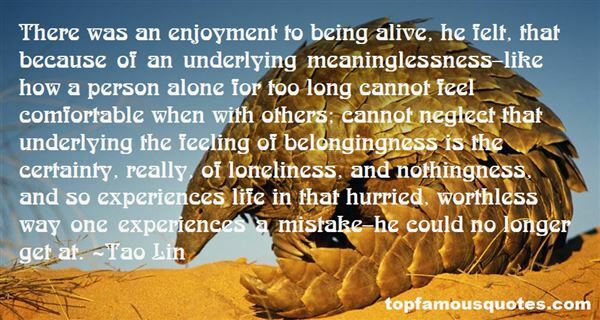 Reading and share top 8 famous quotes and sayings about Meaninglessness Of Life by famous authors and people. 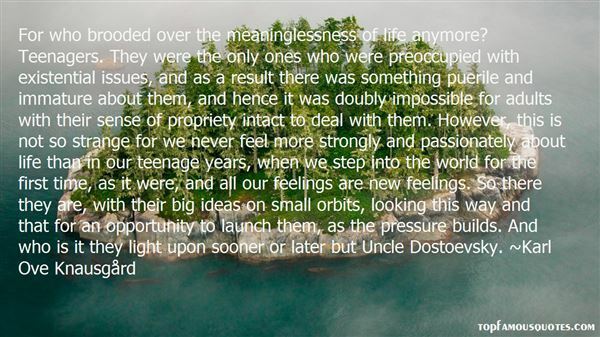 Browse top 8 famous quotes and sayings about Meaninglessness Of Life by most favorite authors. 2. "I resent that the hours seem boring now, emptier. Going through the motions gives you plenty of time to examine the motions. I used to find this interesting. Now it has taken on the taint of meaninglessness. [...] This is the trap of having something to live for: Everything else seems lifeless." 3. 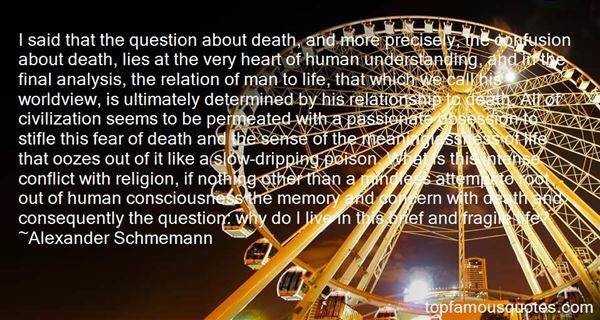 "For who brooded over the meaninglessness of life anymore? Teenagers. They were the only ones who were preoccupied with existential issues, and as a result there was something puerile and immature about them, and hence it was doubly impossible for adults with their sense of propriety intact to deal with them. However, this is not so strange for we never feel more strongly and passionately about life than in our teenage years, when we step into the world for the first time, as it were, and all our feelings are new feelings. So there they are, with their big ideas on small orbits, looking this way and that for an opportunity to launch them, as the pressure builds. And who is it they light upon sooner or later but Uncle Dostoevsky." 4. "One conceals oneself standing silently beside the trunk of a tree and what there is of a reflective tendency in his nature is intensified. One shudders at the thought of the meaninglessness of life while at the same instant, and if the people of the town are his people, one loves life so intensely that tears come into the eyes." 5. "Anxiety, alienation, loneliness, emptiness, and meaninglessness are the fruits of living as an isolated subject admist a multitude of lifeless objects. Although our scope of involvement may extend to numerous and diverse fields of interest and concern, as long as the notion of having predominates, our being remains empty and superficial." 6. "There was an enjoyment to being alive, he felt, that because of an underlying meaninglessness–like how a person alone for too long cannot feel comfortable when with others; cannot neglect that underlying the feeling of belongingness is the certainty, really, of loneliness, and nothingness, and so experiences life in that hurried, worthless way one experiences a mistake–he could no longer get at." 7. "Ultimate meaning necessarily exceeds and surpasses the finite intellectual capacities of man... What is demanded of man is not, as some existential philosophers teach, to endure the meaninglessness of life, but rather to bear his incapacity to grasp its unconditional meaningfulness in rational terms. Logos is deeper than logic." 8. "What is demanded of man is not, as some existential philosophers teach, to endure the meaninglessness of life, but rather to bear his incapacity to grasp its unconditional meaningfulness in rational terms." I'd heard a lot of Asian people were rooting for me, but I had no idea. I was stunned. They were... impassioned, especially compared to Japan. I couldn't even have anticipated that kind of welcome."